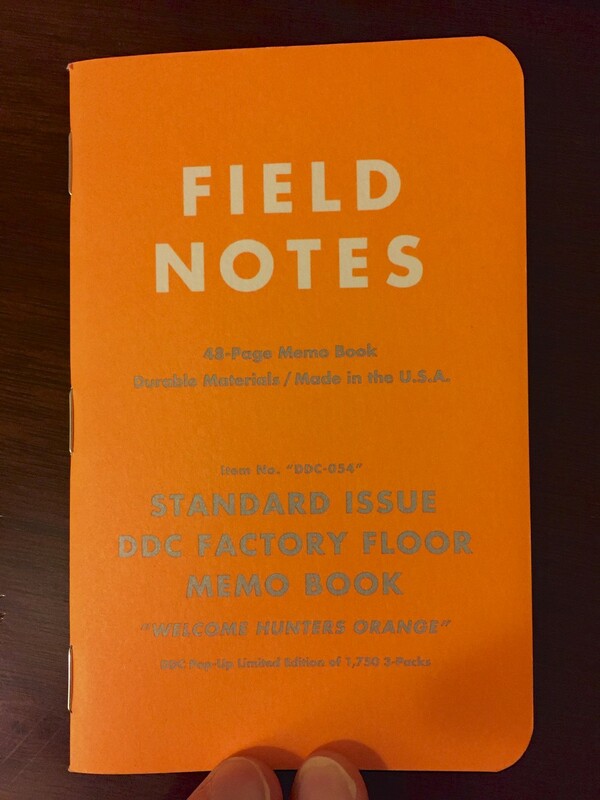 So I went ahead and cracked open my recently received limited edition DDC Factory Floor Field Notes, and decided to use the "Welcome Hunters Orange" book next. I like these books a lot, Though it's way too early to do a comprehensive review, I did want to post some photos and provide some initial impressions. These notebooks are a limited run made by the Draplin Design Co. for their pop-up store in Portland, with a few 3-packs sold through their online store. I consider myself extremely lucky to have snagged some of these. First, the cover colors are eye-popping. The orange notebook is about the same color as the Pen Addict Episode 100 T-Shirt, for those of you who sprung for that. According to the books' specs, the covers are 100# Mohawk Via Vellum, and the interior paper is 50# "Absolute Alabaster." The 50# weight on the internal paper is the same as standard Field Notes Paper; what's awesome is the fact that it's bright white (which unfortunately doesn't photograph well on my limited equipment), and the orange grid ruling is the same "Welcome Hunters Orange" ink as the cover. The other two notebooks, titled "Simple Minded Silver Streak" and "Copper Pipe Night Raid," are equally attractive. The SSSS has a metallic sheen to it, which is nice looking without being sparkly, and the CPNR is apparently the result of combining the orange and silver ink colors to produce the copper colored cover. This picture doesn't really do the paper and graph ruling justice. The paper is super-bright white, and the orange is the same eye-popping color as the cover. And, of course, it wouldn't be a Field Notes memo book without a "Practical Applications" section. This one reads like an "Aaron Draplin Personal Favorites" version, and it's awesome. The interior of the covers are printed in Simple Minded Silver Streak with the Welcome Hunters Orange lettering. Will these be a new favorite? Possibly/very likely. Stay tuned.